Special teams were the difference in this one. The Blue Jackets entered the game with the least efficient power play in the league, but would end up scoring two power play goals to beat the Capitals 2-1. The Capitals return to action Sunday when they host the Arizona Coyotes at Capital One Arena. Puck drop is 5:00 PM. The Capitals made a few roster moves Friday morning before the game. Brooks Orpik was placed on long-term injured reserve (LTIR) and John Carlson was scratched from the Columbus game, listed “day-to-day” with a lower-body injury. As a result, Aaron Ness and Jonas Siegenthaler were recalled from Hershey. 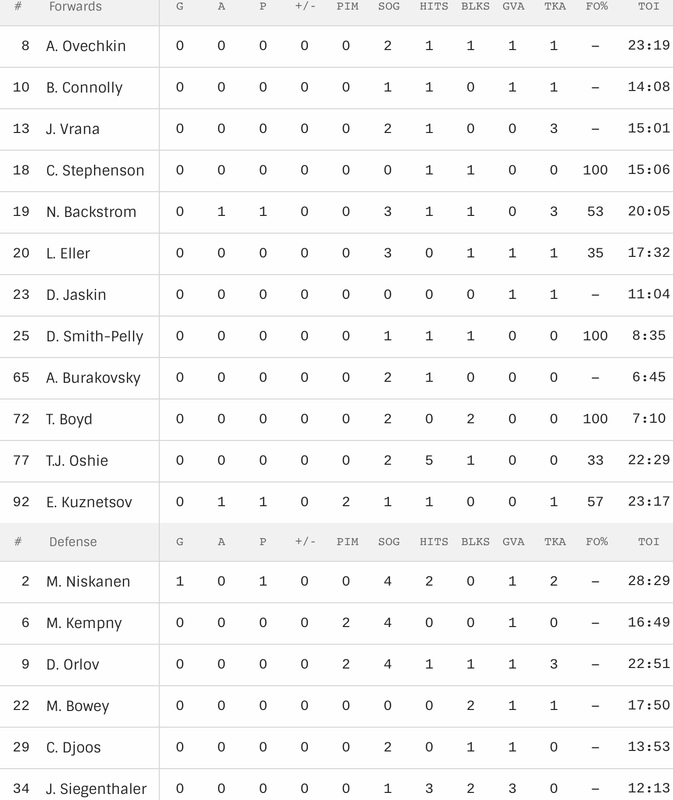 Siegenthaler made his NHL debut, paired with Madison Bowey on the bottom pair. Christian Djoos was paired with Dmitry Orlov on the second pair and Michal Kempny was paired with Matt Niskanen on the top pair. As for scoring, the Blue Jackets would crack the seal with a power play goal late in the first period for a 1-0 lead after 20 minutes. The Caps would tie things up with a power play goal from Matt Niskanen midway through the second period for 1-1 tie at the second intermission. Sound familiar? (here). The Jackets would add another power play goal in the third period for the win. The Caps out-attempted the Jackets 30-12 and led in shots on goal (SOG) 15-9 but trialed 1-0 after one period. 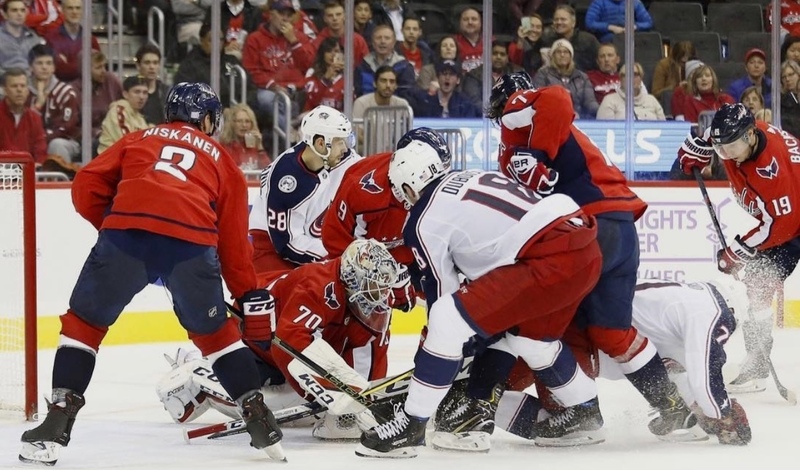 The Blue Jackets would out-attempt the Caps 27-6 and lead in SOG 16-10, but the Caps would score the lone goal in the second period. Shot attempts in the final frame were fairly even, with the Jackets leading in SOG 11-9. Braden Holtby had another very good game, stopping 34 of 36 shots for a .944 save percentage. As noted, both goals given up were a result of the Jackets power play. Holtby has given-up three goals in the last two games, all of them power play goals. He has stopped 75 of 78 shots faced for a .962 save percentage. Sergei Bobrovsky was a tad better for the Jackets, stopping 33 of 34 shots he faced, for a .971 save percentage. As noted at the top, the Blue Jackets entered the game with the least efficient power play in the league, and would score two power play goals. In the end, the Jackets were 2 for 3 and the Capitals 1 for 5 on the man advantage. The difference in the game. The Capitals penalty kill is now 27th in the league with a 72.2% success rate. Keep in mind significant pieces are currently missing from the Caps PK (Tom Wilson, Brooks Orpik and yes, Jay Beagle). The Capitals won the battle at the dot 52-48%. Chandler Stephenson was 1 for 1, Nicklas Backstrom was 8 for 15 (53%), Lars Eller was 6 for 17 (35%), Devante Smith-Pelly was 1 for 1, Travis Boyd was 3 for 3, T.J. Oshie was 1 for 3 (33%) and Evgeny Kuznetsov was 12 for 21 (57%). Andre Burakovsky had the least amount of ice time for the Caps (6:45). It’s difficult to project the next step for Burakovsky, but something needs to change. He has one goal, one assist and 19 shots in 15 games. This entry was posted in News and tagged Columbus Blue Jackets, Inside The Numbers, Jon Sorensen, Jonas Siegenthaler, Penalty Kill, Washington Capitals. Bookmark the permalink. The Caps’ special teams tonight were NOT very special, except especially bad. Before tonight, Columbus was dead last in power play percentage. Yup, dead last. And they did not have a particularly good PK percentage either.